This is a great book with photos taken all around the world to raise awareness of the importance of water to the world and the severity of the water crisis. You will certainly be amazed with what you will see in this book and some facts and photos which can be quite disturbing. 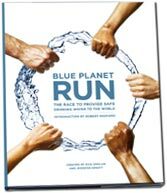 Blue Planet Run provides readers with an extraordinary look at the water problems facing humanity and some of the hopeful solutions being pursued by large and small companies, by entrepreneurs and activists, and by nongovernmental organizations and foundations. By the end of the book, readers are left to form their own conclusions as to whether the human race is capable of taking the steps necessary to solve this global crisis before it’s too late. Blue Planet Run: The Race to Provide Safe Drinking Water to the World can be downloaded from here. Times has a nice photo gallery for the book too.